Rotafix P12 Primer is a solvent-free 2- part unfilled epoxy tack coat used to prepare surfaces prior to the application of epoxy mortars and screeds. Rotafix P12 Primer is a tack coat used in conjunction with any of the Rotafix cement based mortars, screeds and grouts such as Rendacrete, Cembond and EP3 epoxy grout. 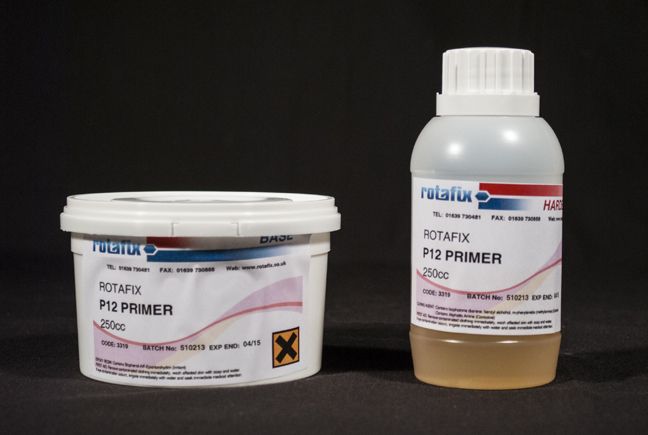 The Rotafix P12 primer creates a tack surface for the cement based products to adhere. It also provides protection to the metallic elements from being attacked by the corrosive elements contained within the cement and mortars. 1 litre of Rotafix P12 Primer covers approximately 3m2 on stone, or 5m2 on steel. Subsequent products should be applied when the tack coat is still wet.